Jerez de la Frontera in Andalucia has a wealth of history which along with the Bodegas, Equine School and Museo de Relojes makes it a wonderful place to visit. Jerez de la Frontera (prononced hereth) is the Andalusian town from which the name Sherry is derived. Along with two other nearby towns, El Puerto de Santa Maria and Sanlucar de Barrameda, it is the only place in the world where sherry is produced. There is not a great deal of difference between the wines of Jerez and those of El Puerto, although the latter town does tend to be particularly noted for its' amontillados and finos. Sanlucar on the other hand produces an entirely different wine as all the manzanilla, with its' distinctive, fresh flavour, is produced here. Built on this bedrock of sherry and brandy production, Jerez has long been amongst Spain's most commercially successful towns.The old Anglo-Andaluz sherry dynasties still wield much social and economic power here. The promotional slogan for the town is "Jerez-Pura Andalucia" which embodies the idealised images of this region such as rich land barons, grand palaces and large estates, finely bred horses and fighting bulls, lively and passionate flamenco, beautiful women and handsome men and of course much flowing wine. A visit to Jerez has much to commend it as there is much to see and do. First on most people's agenda of course is a tour of one, or perhaps more, of the bodegas. Here you can see sherry in production and get to sample it too. I have put a list of some of the most important bodegas along with their tour details at the bottom of the page. Another essential visit is to the Real Escuela Andaluza del Arte Ecuestra, or the school of equestrian art.On most days it is possible to see here the stables, a wonderful collection of carriages and training sessions. On Thursdays a fascinating and perfected performance is given of an equestrian ballet. This fabulous spectacle is set to Spanish music and performed in 17th. Century costumes. Also to be included in your itinerary is a visit to the Museo de Relojes.It houses one of Europ's most varied and interesting collection of working time pieces, a total of 300 in all, dating from the 17th. to the 19th. Centuries. 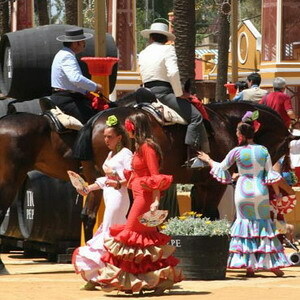 There are two events year which make a visit to Jerez extra special, the first takes place in May when the annual Jerez Horse Fair takes place. This marvellous spectacle is one of Spain's oldest fairs and in the middle ages attracted traders from all over Europe. Traditionally the sale of a horse is confirmed when the purchaser takes hold of the reins, so be careful!! The second event, Fiestas de Otoño, is, along with the May Feria de caballo, the biggest celebration of the year in Jerez. Starting at the end of September, and continuing into October, the Fiestas include the veneration of the Patroness, the Virgen de la Merced (24th September), and the celebrations of the grape harvest, which includes the Treading of the Grapes and the Blessing of the Must (the first wine of the year). The day of the Patron San Dionisio, is celebrated on the 9th of October and coincides with the International Horse Week and the Great Horse Parade, which sees over a thousand horses parading the main streets of the town. Visitors can also go to watch the exciting horse races and the Cane and Lance Games. Needless to say that there is the singing, dancing, colour and gaiety at the festivals that typically characterises Andalucía and its people. So if you are holidaying in Andalucia then a trip to Jerez will certainly add much to your trip, particularly if you are there in May or September/October. About the Author - Article submitted by Ruth Polak the owner of www.costadelsol-vacationrentals.com A web site specializing in holiday villas and apartments on the Costa del Sol and in Rural Andalucia. You will also find lots of information about Spain and Andalucia, in particular.